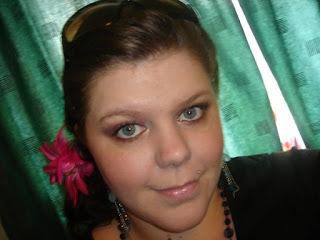 Sophsterlicious • UK Blog: Make-up Today! Man, it feels sooo good to be able to put make-up on again now that my sty has gone! I have had a pretty productive day today I feel. I tidied up the spare room (which is where I do my videos) and got some of my summer clothes out and ready to wear, now that the sun seems to be around, although it'll probably bugger off now I have done that! Anyway, after I had been productive I set about making some new videos, one is a tutorial and the other a Vlog/Update. I did quite a neutral-ish look (for me) and I like how it came out. I have recently discovered some L'Oreal Colour Appeal Holographic eye shadows in my make-up that I had been neglecting and I love them! 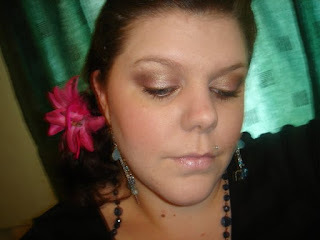 I used one in this look and it is called Solar Pink and is a lovely pink/gold/green duo chrome colour. I then put a brown in the crease and blended it lots so it looked quite soft. ooh this is a pretty look on you. love it! You look very pretty. Gosh, you look so familiar to me...I just don't know why!!! I must have come across your blog before or something.